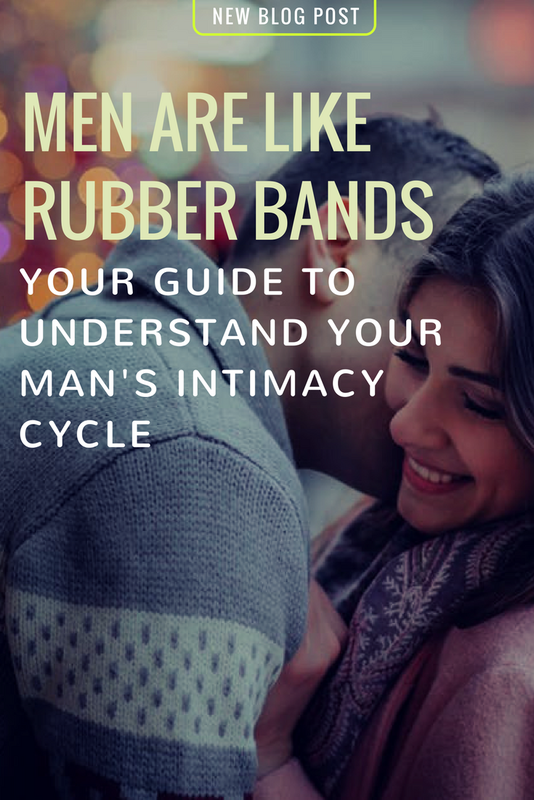 Men have an intimacy cycle that is different from the women’s, it involves getting close, then pulling back and again getting close, exactly like a rubber band; it can only stretch so far only to come springing back. It’s a natural cycle for a man, it’s not his decision nor it is his choice. It’s not his fault, nor it is his woman’s. Women, on the other hand, get confused when their man pulls away. It’s understandable because a woman only pulls away when she doesn’t trust her man to understand her feelings, when she had been hurt and is afraid of getting hurt again or when he had disappointed her. Therefore, most women misinterpret their men retreat. In a loving relationship, a man cares a lot about his partner, he tries his best to fulfill her needs and desires, gradually he starts to lose his sense of self and feel the need to retreat in order to re-establish his personal boundaries and fulfill his need for independence. A man pulls away to fulfill his needs for independence and autonomy, he alternates between fulfilling his needs for intimacy and then fulfilling his needs for autonomy. When a man has fulfilled his need for intimacy, he retreats and distances himself until he fulfills his need for autonomy, then he’ll feel again the need for love and intimacy and he’ll come springing back. He doesn’t need time to get reacquainted again, he’ll pick up the relationship from the same point of intimacy he left when he pulled away. This might be confusing for the woman, because for her, if she had pulled away, she’ll need a period of reacquaintance, as a result, she probably will find it hard to trust her man’s sudden desire for intimacy. A Woman often panics when she feels her man is distancing himself from her given that he does that without an explanation. She thinks she had done or said something that has turned him off and she fears that he’ll never come back again. To make matters worse, she tries to run after him which would only make her man even more distant and would prevent him from feeling his need for intimacy and to be with her again. If a man never gets the chance to pull away, he won’t feel the need to be close. If anything, the more the woman runs after her man, the more he’ll try to escape her and distance himself. It’s not what she says that triggers his retreat, but when she says it. A woman pushes her man to talk about his feelings when she notices how distance he became, at that time and that phase of his intimacy cycle, the man needs his own time and space and pushing him to talk about his feelings, would only push him away farther. A man himself doesn’t understand the cycle of intimacy he goes through, that’s why when a woman questions his pulling away, he can’t find an explanation, it just happens. It wasn’t his choice, nor was it his decision. Both of them, without understanding this cycle, might easily start doubting their love for each other; the woman is watching her man distant and rejecting when approached and the man can’t get in touch with his needs for intimacy and get close because his woman is running after him. Moreover, when the man wants to get closer again, a woman might find it difficult to initiate the conversation. She’s afraid because the last time she talked, her man has withdrawn, she mistakenly assumes that he won’t listen. She might also assume that he’s upset with her and therefore, will wait for him to initiate a conversation or also, she might approach her man by asking questions about his feelings and if anything was wrong which might be confusing for a man, because, for him, nothing is wrong. When a man doesn’t pull away, because he thinks that as a couple, they shouldn’t spend time apart or because he feels guilty when he spends some time alone, if he doesn’t pull away, after a while, few symptoms are to arise, like moodiness, feeling irritable and defensive… His natural intimacy cycle is broken, he doesn’t feel balanced anymore and problems begin to arise in the relationship. Accept that your man needs his space. When he withdraws, don’t run after him and trust that he’ll come back when he’s ready. The more you’ll accept that part of him, the sooner he’ll come springing back. When your man is pulling away, it’s not the time to talk or try to get closer. Eventually, he’ll come back, and will be supportive and loving as though nothing had happened, that’s the time to talk. Initiate the conversation, not by asking him about his feelings and the reasons why he retreated, but by sharing even if he has little to say. Appreciate him for listening and gradually your man will have more to say and begin to open up to you. You can say something along the following: “My dear, would you listen to me for a while, I’ve had a hard day and I would appreciate you listening to me, it would make me feel much better.” Men, unfortunately, don’t realize how important talking is for women. Without being appreciated and encouraged, a man might lose interest in listening, he might feel as though he’s not being useful. You need to understand that a man doesn’t talk for the sake of talking, he needs a reason to talk, when you start sharing with him, he eventually will relate to the things you’re sharing and start talking. Don’t demand from him to talk, if being pushed a man will resist even if he has things to share. Instead of rejecting your man’s silence, learn to appreciate it, for it makes him a better listener. Your man needs to feel accepted before he can open up and talk. When your man is pulling away, this is a chance for you to be independent, to take better care of yourself and have some time for yourself, you can do the things you enjoy doing, you can go out with your girl friends and cherish your relationships with them.